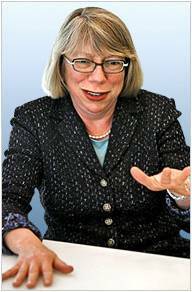 Girl Scouts of the USA took action on March 29, 2011, to appoint Barbara Krumsiek, CEO of the Calvert Group, and Linda Descano, President and CEO of Citi’s Women’s group, to the National Board of Directors. This change comes as Girl Scouts of the USA prepares for the organizations 100th anniversary, its’ most aggressive fund development campaign ever, and in the midst of an executive search for the next CEO, who will take over after Kathy Cloninger retirees later this year. Barbara J. Krumsiek is Chair, CEO and President of Calvert Group, Ltd., a leading investment management firm headquartered in Bethesda, Maryland. Calvert manages over $14 billion in assets. In 2010, Krumsiek told the New York Times that her experience in Girl Scouting contributed greatly to her success. Linda Descano is President & CEO of Women & Co., a division of Citi that provides women with financial resources and a community for building their financial knowledge, exchanging financial insights, and accessing tips and tools for creating financial strategies based on the realities of women’s financial lives. Linda joined Women & Co. in 2003 as Chief Operating Officer and was appointed as President in 2007 and CEO in 2010.